This product requires the base game The Crew. 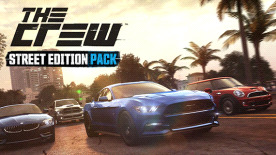 Unlock all pre-order content with this bundle including the MINI COOPER S 2010 - Street Edition Pack, the BMW Z4 sDrive35is 2011 - Street Edition Pack, the DODGE RAM SRT-10 - Street Edition Pack, the 2015 Ford Mustang GT Fastback - Street Edition Pack, the Show Off Pack, the Racer Pack and the Surfer pack. Street Edition cars are delivered with the dedicated Street spec, other specs cannot be equipped.